Advertising affiliate giant, Linkshare Japan and Traffic Gate, a subsidiary of Japan’s e-commerce giant, Rakuten have been merged. Although Linkshare Japan was formed from a partnership with Linkshare USA and Mitsui and Co. Ltd., Rakuten purchased Linkshare USA for 425 million dollars. On the other hand, Traffic Gate was a 100% subsidiary company of Rakuten. 36.25% of the shares of the newly formed Linkshare Japan’s were held by Rakuten, 36.25% were held by Mitsui and 27.5% held by Linkshare USA resulting in Rakuten acquiring management control of the new company. So why has Rakuten chosen now to enter the advertising affiliate market? That is because the Web is in a post-Google period and a Golden Age for social media. Through the transmission of information between people utilizing their relationships to each other, the affiliate market has the potential to expand rapidly in the near future. At a discussion panel at an affiliate trade fair held in Tokyo on the 15th, Linkshare Japan’s co-CEOs Shintaro Komiyama and Keigo Tsuda emphasized, “It is precisely because of this period of social media that the affiliate market will expand quickly.” Seeing a golden opportunity in the height of social media, they reacted quickly to go through with the merger. Linkshare Japan has released APIs and other tools to allow third party developers to access their product databases. Linkshare Japan is pushing to create an open platform that would allow the use of tools and APIs from other companies. 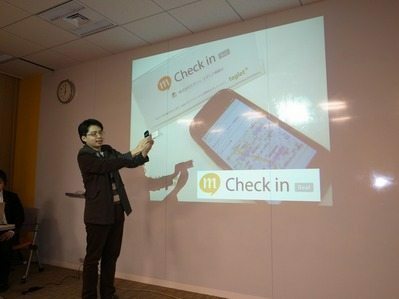 By holding developer contests and other events, Linkshare Japan has already established many tools developed by third-party developers. To encourage third-party developers to want to develop tools for their platform, the size of the platform has to be large enough to make it seem worthwhile to put in the time to develop for. To follow through with this strategy, the scale of their operation needed to be expanded. According to the press release, the merger brings together Linkshare Japan’s approximately 400,000 affilliate sites and Traffic Gate’s approx. 200,000 sites with Rakuten’s approx. 5 million affiliate sites resulting in combined traffic worth almost 400 billion yen becoming Japan’s largest affiliate network. They plan to leverage the vast scale of the new network to push development of the open platform. to each individual user. Content publishers will then simply be able to place a box to automatically display highly targeted advertising and not have to manually change ad banners ever again. With their gigantic user bases, Google, Facebook and others also focus on their ability to deliver highly targeted advertising interspersed between communications of individual users. From a global perspective, what Rakuten and Linkshare are attempting on another level is nothing new. However, Rakuten and Linkshare are attempting is something that even Google and Facebook have not yet implemented: the integration of electronic money. Last autumn, Rakuten and e-money company BitWallet entered into a capital partnership where BitWallet has become an affiliated subsidiary of Rakuten. After the merger between Linkshare and Traffic Gate, Rakuten will integrate Edy, BitWallet’s e-money system into the newly merged affiliate network. Affiliate advertisers will now be able to know whether their advertising led to actual sales in brick-and-mortar stores from transaction records processed by Edy. Advertisers have started to demand better ways in measuring the effectiveness of their advertising. There are no better ways in measuring the effect of advertising campaigns than from actual sales figures. As the use of Edy becomes more mainstream in Japan, it will become ever more feasible that advertises will spend more money on affiliate advertising campaigns just because they can measure the results more accurately. Affiliate advertising are now being used on the web, but in the near future it will also be used in real brick-and-mortar stores as well. Linkshare has the ability to expand globally starting in the Asian market. Last week’s trade fair focused on the domestic market and not much was discussed on the international market. However, the merger announcement mentioned the global expansion as one of the three purpose of the merger. Linkshare and Rakuten plan to begin development of their strategies in 2011 while taking into account the current climate of the e-commerce markets around each country in Asia. By developing a platform that could expand into the global market, they will provide the infrastructure to allow advertisers to reach a global audience. Hiroshi Mikitani, CEO of Rakuten, surprised many of his workers by announcing English as the company’s official language in their staff meetings. This is most likely because he want the company to prepare itself for eventual expansion into the global market. In this time of change, the mood within the company is favorable. With the rise of the golden age of social media, Rakuten is making big strides to meet the challenges that it brings.